Last Thursday, I had the opportunity to sit across from Bob Dyson at his office in Del Mar and listen to this real estate legend discuss today’s real estate market. We were also fortunate to have Chris Dyson videotaping much of the discussion, which we have divided into four segments. 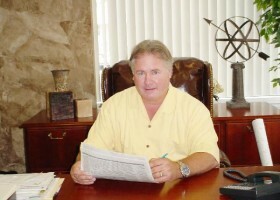 At the start of our interview, Bob Dyson said these are the worst conditions he has seen during his 40 years in the real estate business–citing symptoms such as lack of buyer confidence and the drastic deflation in certain real estate markets–including San Diego, of course, along with the rest of California, Nevada, Arizona and Florida. At the same time,he says, there is a large and growing backlog of buyers who want to buy–and are just waiting for reassurance that the real estate market has really bottomed, or is at least close to that point. With the economic recession that caused the drastic deflation in certain real estate markets, I wouldn't be surprised that some people are using unorthodox methods in sales, especially in high commission sales like the real estate. I just hope that the economy would quickly and fully recover so that we won't have to be stretched too thin.